Produced in conjunction with the Victoria and Albert Museum in London to coincide with their Arts and Crafts exhibition, this print is called "Daisy" and is a William Morris originial. 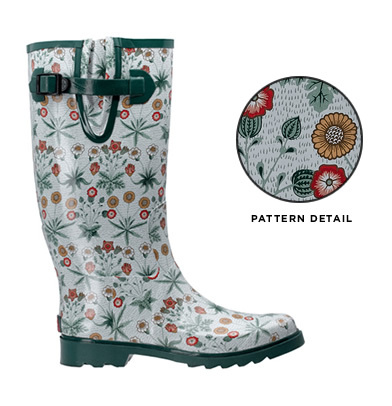 The pattern is particularly suited to a wellington boot with its subtle floral print and pale green background. Measuring approximately 15" high, this boot features a printed rubber exterior, full cotton lining, a 1" heel, a rubber lug sole and an adjustable buckle at the top of boot.